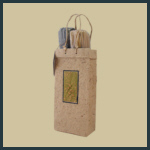 Our gorgeous selection of gifts totes are quite durable, reusable, eco-friendly and made from exquisite handmade papers. Here you will find a range of options where you can create your own unique present for someone special! 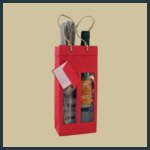 Each of these will hold two of our gourmet items - up to two tall bottles from our balsamic vinegars or olive oils, and/or two tall pasta packages from either our regular or gluten free line. The linguini & fettuccine fit the best. Each tote comes with a gift tag attached. This festive standout is bright red in color, also handmade, and has two windowed compartments which show off the gifts you choose inside. The bag will hold two tall bottles , two pasta packages or one of each. Think Christmas, Valentines, or just cuz. High contrast & bold, this stylish handmade tote has two windowed compartments which show off the fine gourmet goodies you choose inside. 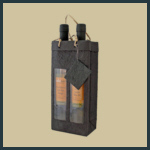 This durable reusable black bag will hold two tall bottles, two pasta packages or one of each. This handsome tote is handmade, olive green in color, and has a decorative handcrafted olive branch on the outside. This too will hold two of the following items: our tall balsamic vinegar, tall olive oil and/or a tall regular or gluten free pasta. 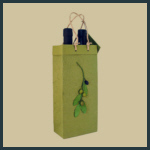 An artistic olive branch relief adorns this exquisite natural paper tote. Like the other tall wide totes in this section, this will hold two of the following items: our tall balsamic vinegar, tall olive oil and/or a tall regular or gluten free pasta.